If you want to know what L-citrulline is, why people supplement with it, and how it can benefit you, then you want to read this article. Look at most popular pre-workout supplements and you’ll find they have several ingredients common. L-citrulline is one of them. Its name comes from citrullus, the Latin word for watermelon, which is a natural source of it. Other food sources include peanuts, soybeans, and kidney beans. Most supplements aren’t all that special and can’t live up to the hype, but, as you’ll see, L-citrulline is one of the proven winners. How much do you have to take to see results? What’s the best way to supplement with it? Why Do People Supplement with L-Citrulline? What Are the Benefits of L-Citrulline? What Is the Clinically Effective Dose of L-Citrulline? What Kind of Results Should I Expect From Taking L-Citrulline? Does L-Citrulline Have Any Side Effects? L-citrulline is a non-essential amino acid, which means you don’t necessarily have to get it from foods because the body can produce it as needed. Essential amino acids, on the other hand, must be obtained from your diet because the body has no way to synthesize them. And in case you’re wondering, the “L-” refers to the structure of the amino acid and denotes that it can be used to create proteins (the other type of amino acid is the “D-” form, which are found in cells but not in proteins). Physiologically speaking, L-citrulline plays a key role in the Urea cycle, which is the process whereby the body eliminates toxic byproducts of digesting protein and generating cellular energy. It gets its name from the fact that these waste products are converted into a substance called urea, which is expelled from the body through the urine and sweat. The main reasons why people supplement with L-citrulline are improving heart health, blood flow, and endurance, and boosting muscle growth and recovery. This is why it’s a particularly popular supplement among athletes of all types. It’s also often chosen over another well-known molecule involved in the Urea cycle: L-arginine. If you’ve heard of L-arginine, you probably know it as as a “nitric oxide booster,” but research shows it’s unreliable in this mechanism (it works for some people but doesn’t for others). The best that can be said about arginine is if you take enough (6 to 10 grams), it may or may not help you get more out of your workouts. This explains why most nitric oxide supplements are very hit-and-miss – some people enjoy bigger pumps and better workouts and others notice absolutely nothing. L-citrulline, on the other hand, is absorbed better than L-arginine and turns into it in the kidneys, resulting in larger and longer elevations of plasma (blood) arginine levels than supplementation with L-arginine itself. It also elevates plasma levels of another amino acid, ornithine, which is also involved in the Urea cycle. In the grand scheme of supplementation, L-citrulline is pretty obscure. It doesn’t get nearly as much attention as molecules like creatine, beta-alanine, and fish oil, but I think it deserves a bit more of the limelight because, as you’ll see, it has quite a few science-backed health and performance benefits. Research shows that supplementing with L-citrulline can improve both your resistance and endurance training. For example, in one study conducted with resistance-trained men, supplementing with 8 grams of L-citrulline before their chest workouts increased the number of reps they could do by 52%. It also significantly decreased post-workout muscle soreness. In another study, 6 grams of L-citrulline per day increased cellular energy production (ATP) during exercise by 34%, which increases your capacity for physical output and intensity. Arteries are blood vessels that convey oxygenated blood throughout the body. They naturally contract and expand to control blood pressure, and it’s vital that they retain their ability to do this because if they get too stiff and rigid or, even worse, blocked, it can result in a heart attack or stroke. As nitric oxide plays a key role in maintaining arterial health and function, anything that boosts NO levels can help keep our arteries working the way that they should. And that’s why research shows that L-citrulline can do just that. Furthermore, it has also been shown to reduce blood pressure, which is another key factor in overall heart health. Since it can influence blood flow, L-citrulline can help give guys harder boners (yeah, that’s the technical term). It may not be as effective as erectile dysfunction drugs, but it also doesn’t have any of the potential side effects. Free radicals are atoms or groups of atoms that can, through chemical reactions, cause damage to cells in the body. While free radicals play a vital role in certain basic physiological processes necessary for life, excessive amounts have been associated with aging, and age dependent diseases such as cardiovascular disease, cancer, neurodegenerative disorders, and other chronic conditions. Everyday living inevitably results in the production of free radicals, and intense exercise spikes production as well (because it places the body under large amounts of stress). Studies show that L-citrulline helps your body better deal with the exercise-induced uptick in free radical production by priming immune cells and reducing the number of free radicals produced while working out. “The what?” you might be thinking. The clinically effective dose of a supplement is the amount used in the scientific studies that demonstrate its benefits. You see, it’s not enough to just know that L-citrulline can benefit you in various ways — you need to know how much you need to take to get those benefits. And the only difference between them is citrulline malate is L-citrulline combined with malic acid, which is a natural substance found in many fruits that’s involved in the creation of cellular energy. There isn’t much human research available on the potential benefits of supplementing with malic acid, but it has been shown to improve endurance in the animal model. There’s also evidence that, when combined with magnesium, it can help treat fibromyalgia. It may offer cardiovascular benefits as well. It’s likely that malic acid confers additional health and performance benefits. It’s the form used in most studies demonstrating the performance benefits associated with L-citrulline. That is, there’s no downside to citrulline malate and it’s likely superior to just L-citrulline, at least for the purpose of having better workouts. So, with that out of the way, let’s now look at the clinically effective doses of the two forms. For non-exercise-related benefits, take 3 grams of L-citrulline or 5 to 6 grams of citrulline malate per day. For improving exercise performance, take 3 to 5 grams of L-citrulline or 6 to 8 grams of citrulline malate per day. If you’re excited about citrulline by now, I understand. There aren’t many supplements that have been scientifically proven to improve both exercise performance and physical health. Let’s remember, though, that supplements don’t build great physiques and healthy bodies. Dedication to proper training and nutrition does. Since being discovered in 1930, there have been no reported side effects of supplementing with L-citrulline, even at high doses. That said, it’s known to interact adversely with certain medications including nitrates and drugs for erectile dysfunction. As with all supplements, it’s better to be safe than sorry, so if you’re taking any medications or are pregnant or breastfeeding, check with your doctor before jumping onto the L-citrulline bandwagon. L-citrulline is often found in pre-workout supplements, and now you know why. Remember, though, if a pre-workout supplement contains less than 6 grams of citrulline malate per serving (and calls for one serving per day), don’t buy it. It’s underdosed. You want to see 6 to 8 grams and the closer to 8 grams, the better. That also means you should stay away from supplements containing “proprietary blends,” because there’s no way for you to know the doses of each ingredient in the blends. 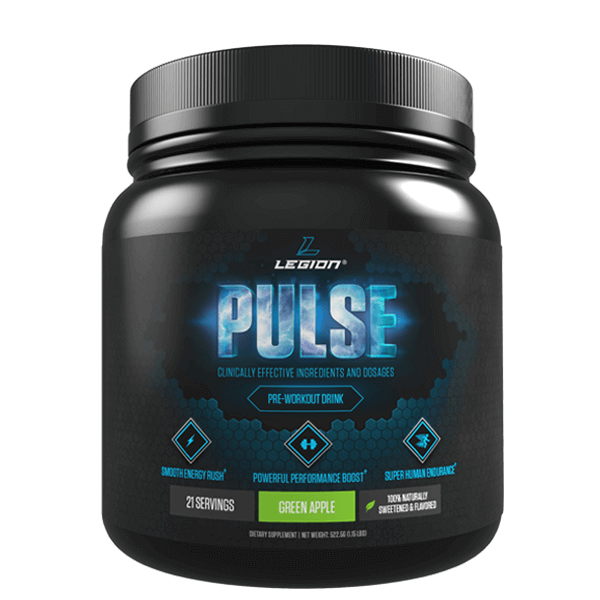 Now, if you’ve made it this far in the article, you’re probably not surprised to learn that my pre-workout supplement PULSE contains a clinically effective dose of 8 grams of citrulline malate per serving. Caffeine is good for more than the energy boost. It also increases muscle endurance and strength. Beta-alanine is a naturally occurring amino acid that reduces exercise-induced fatigue, improves anaerobic exercise capacity, and can accelerate muscle growth. Betaine is a compound found in plants like beets that improves muscle endurance, increases strength, and increases human growth hormone and insulin-like growth factor 1 production in response to acute exercise. Ornithine is an amino acid found in high amounts in dairy and meat that reduces fatigue in prolonged exercise and promotes lipid oxidation (the burning of fat for energy as opposed to carbohydrate or glycogen). Theanine is an amino acid found primarily in tea that reduces the effects of mental and physical stress, increases the production of nitric oxide, which improves blood flow, and improves alertness, focus, attention, memory, mental task performance, and mood. L-citrulline is becoming more popular these days, and for good reason. Studies clearly show that it can help you have better workouts, recover faster, and support your heart health. And with no side effects! All you need to do to enjoy these benefits is take 6 to 8 grams of citrulline malate per day. What’s your take on L-citrulline? Have anything else to share? Let me know in the comments below!